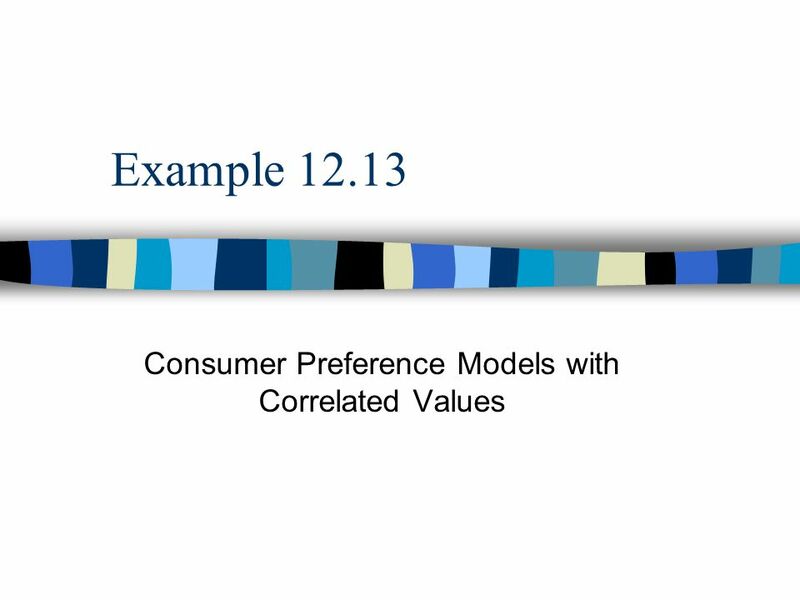 Example 12.13 Consumer Preference Models with Correlated Values. 2 12.112.1 | 12.2 | 12.3 | 12.4 | 12.5 | 12.6 |12.7 | 12.8 | 12.9 | 12.10 | 12.11 | 12.12 | 12.14 | 12.15 | 12.16 | 12.1712.212.312.412.512.612.712.812.9 12.1012.1112.1212.1412.1512.1612.17 Background Information n There are currently two brands of brownies on the market. 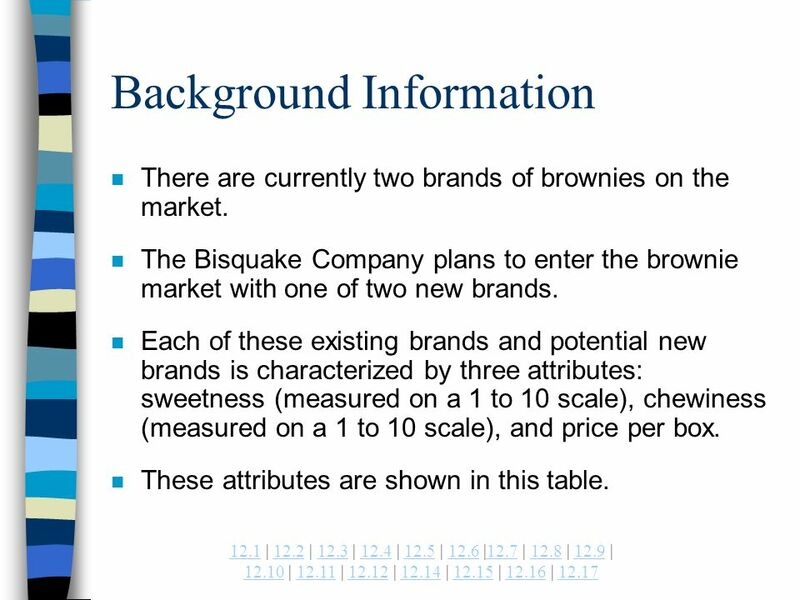 n The Bisquake Company plans to enter the brownie market with one of two new brands. 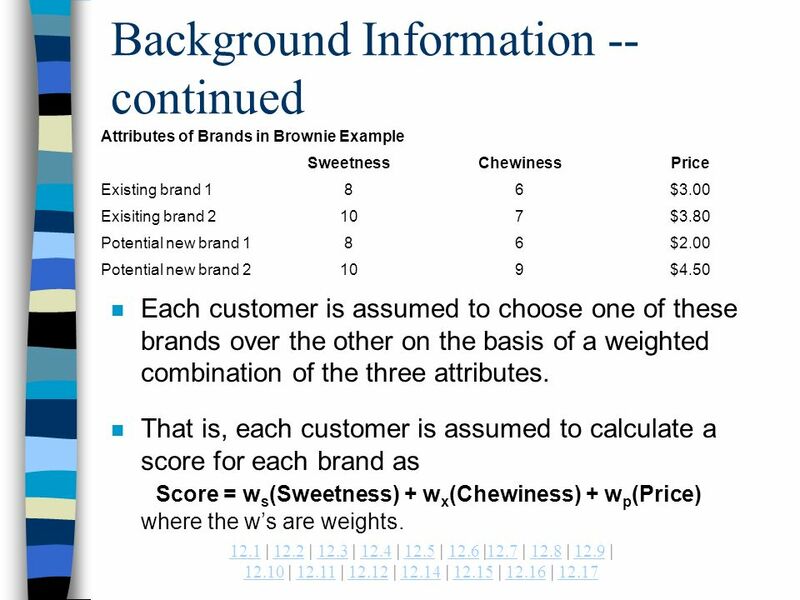 n Each of these existing brands and potential new brands is characterized by three attributes: sweetness (measured on a 1 to 10 scale), chewiness (measured on a 1 to 10 scale), and price per box. n These attributes are shown in this table. 4 12.112.1 | 12.2 | 12.3 | 12.4 | 12.5 | 12.6 |12.7 | 12.8 | 12.9 | 12.10 | 12.11 | 12.12 | 12.14 | 12.15 | 12.16 | 12.1712.212.312.412.512.612.712.812.9 12.1012.1112.1212.1412.1512.1612.17 Background Information -- continued n Each customers weights are different, depending on how important sweetness, chewiness, and price are to the customer. However, we might expect these weights to be correlated. 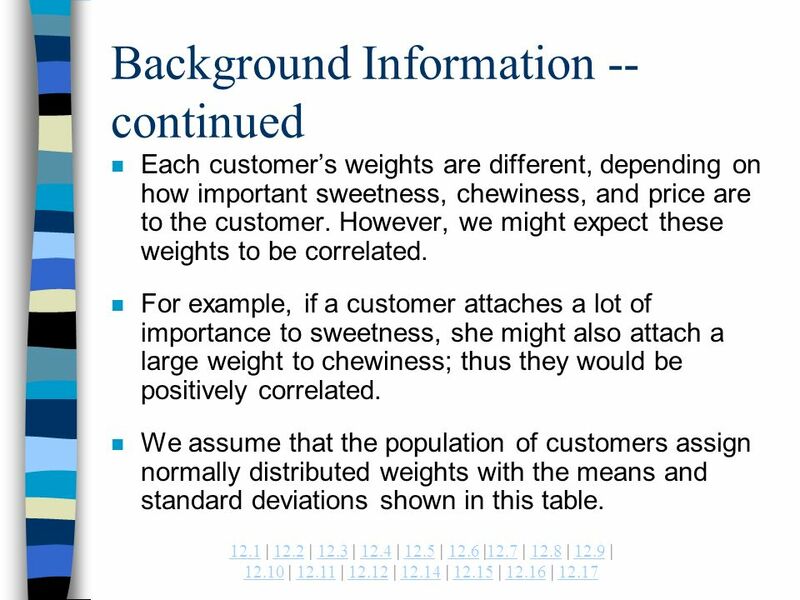 n For example, if a customer attaches a lot of importance to sweetness, she might also attach a large weight to chewiness; thus they would be positively correlated. n We assume that the population of customers assign normally distributed weights with the means and standard deviations shown in this table. 6 12.112.1 | 12.2 | 12.3 | 12.4 | 12.5 | 12.6 |12.7 | 12.8 | 12.9 | 12.10 | 12.11 | 12.12 | 12.14 | 12.15 | 12.16 | 12.1712.212.312.412.512.612.712.812.9 12.1012.1112.1212.1412.1512.1612.17 Background Information -- continued n Note that all correlations are positive, which implies that if a customer puts a large weight on one attribute, he will tend to put a large weight on the other two attributes. 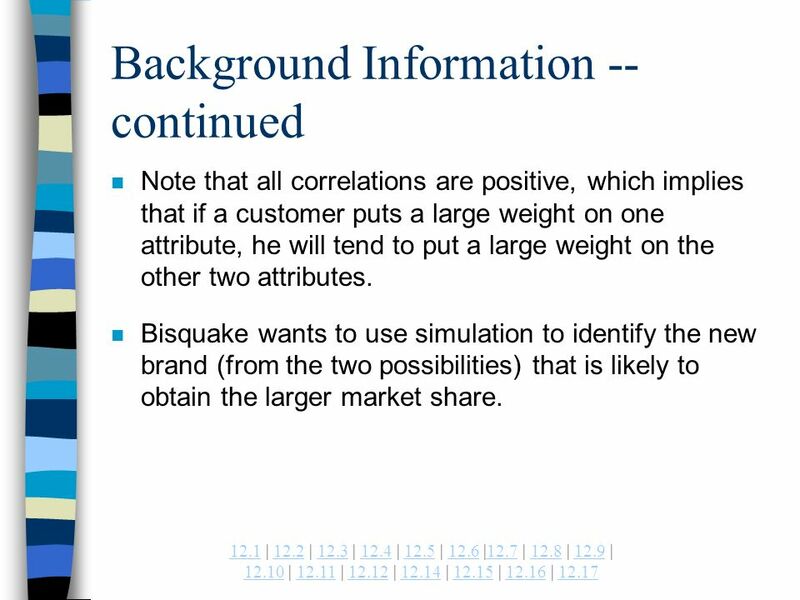 n Bisquake wants to use simulation to identify the new brand (from the two possibilities) that is likely to obtain the larger market share. 7 12.112.1 | 12.2 | 12.3 | 12.4 | 12.5 | 12.6 |12.7 | 12.8 | 12.9 | 12.10 | 12.11 | 12.12 | 12.14 | 12.15 | 12.16 | 12.1712.212.312.412.512.612.712.812.9 12.1012.1112.1212.1412.1512.1612.17 Simulation n A single iteration of this simulation will simulate the behavior of a single customer. That is, it will generate this customers weights, find the customers scores for each of these brands, and see whether the customer prefers new brand 1 or new brand 2 to the existing brands. 8 12.112.1 | 12.2 | 12.3 | 12.4 | 12.5 | 12.6 |12.7 | 12.8 | 12.9 | 12.10 | 12.11 | 12.12 | 12.14 | 12.15 | 12.16 | 12.1712.212.312.412.512.612.712.812.9 12.1012.1112.1212.1412.1512.1612.17 BROWNIE.XLS n This file provides the setup to develop the model seen on the next slide. 10 12.112.1 | 12.2 | 12.3 | 12.4 | 12.5 | 12.6 |12.7 | 12.8 | 12.9 | 12.10 | 12.11 | 12.12 | 12.14 | 12.15 | 12.16 | 12.1712.212.312.412.512.612.712.812.9 12.1012.1112.1212.1412.1512.1612.17 Developing the Spreadsheet Model n The model can be formed with the following steps: –Inputs. Enter the inputs in the shaded ranges. 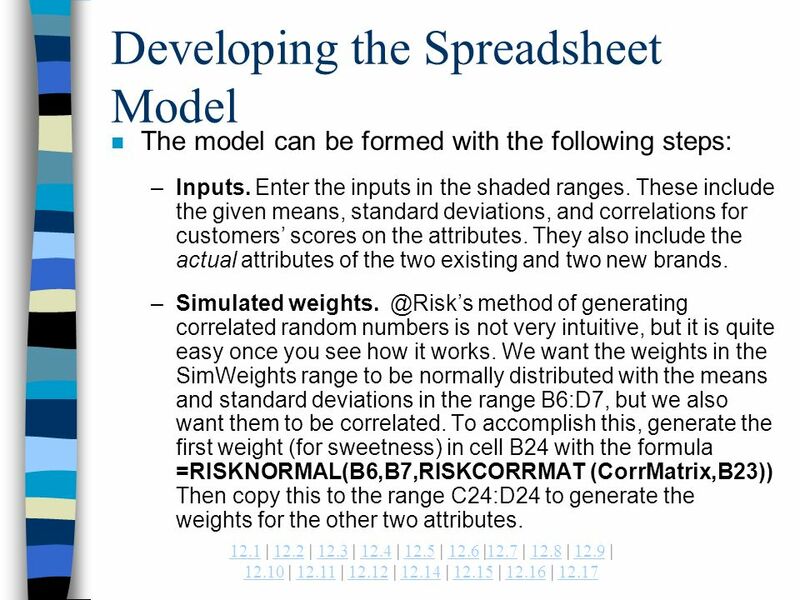 These include the given means, standard deviations, and correlations for customers scores on the attributes. They also include the actual attributes of the two existing and two new brands. –Simulated weights. 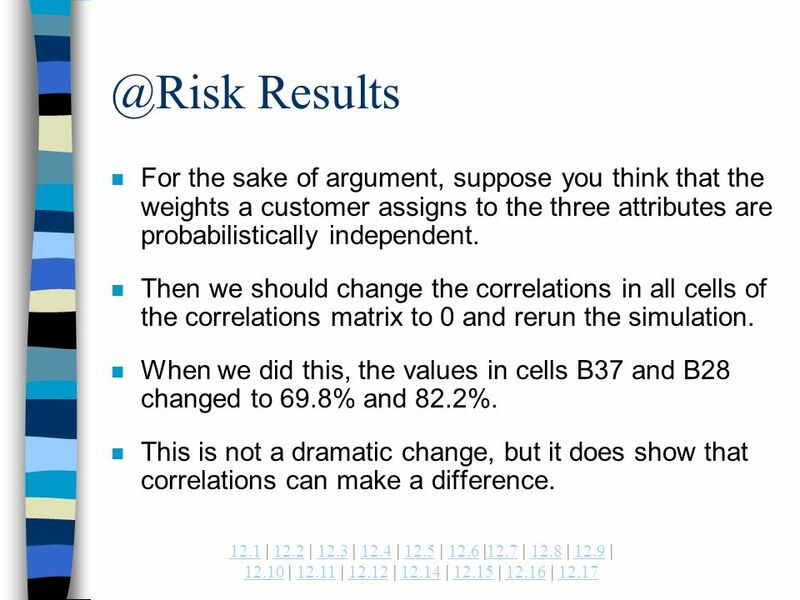 @Risks method of generating correlated random numbers is not very intuitive, but it is quite easy once you see how it works. We want the weights in the SimWeights range to be normally distributed with the means and standard deviations in the range B6:D7, but we also want them to be correlated. 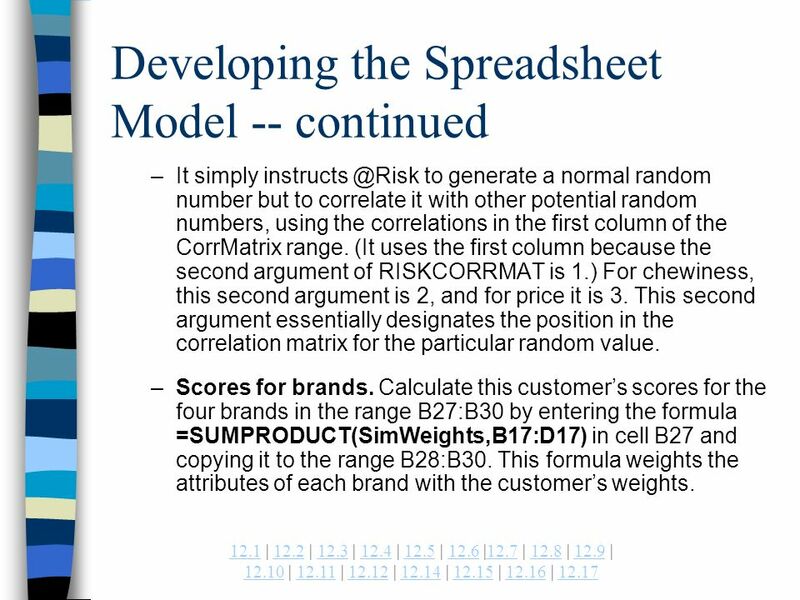 To accomplish this, generate the first weight (for sweetness) in cell B24 with the formula =RISKNORMAL(B6,B7,RISKCORRMAT (CorrMatrix,B23)) Then copy this to the range C24:D24 to generate the weights for the other two attributes. 11 12.112.1 | 12.2 | 12.3 | 12.4 | 12.5 | 12.6 |12.7 | 12.8 | 12.9 | 12.10 | 12.11 | 12.12 | 12.14 | 12.15 | 12.16 | 12.1712.212.312.412.512.612.712.812.9 12.1012.1112.1212.1412.1512.1612.17 Developing the Spreadsheet Model -- continued –It simply instructs @Risk to generate a normal random number but to correlate it with other potential random numbers, using the correlations in the first column of the CorrMatrix range. (It uses the first column because the second argument of RISKCORRMAT is 1.) For chewiness, this second argument is 2, and for price it is 3. This second argument essentially designates the position in the correlation matrix for the particular random value. –Scores for brands. 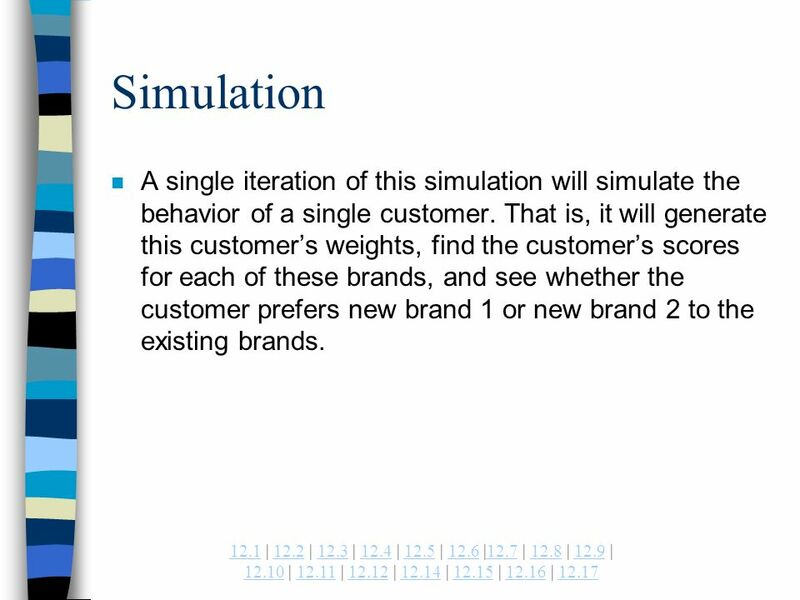 Calculate this customers scores for the four brands in the range B27:B30 by entering the formula =SUMPRODUCT(SimWeights,B17:D17) in cell B27 and copying it to the range B28:B30. This formula weights the attributes of each brand with the customers weights. 12 12.112.1 | 12.2 | 12.3 | 12.4 | 12.5 | 12.6 |12.7 | 12.8 | 12.9 | 12.10 | 12.11 | 12.12 | 12.14 | 12.15 | 12.16 | 12.1712.212.312.412.512.612.712.812.9 12.1012.1112.1212.1412.1512.1612.17 Developing the Spreadsheet Model -- continued –Is either new brand chosen? One of the new brands will be chosen if its score is larger than the larger score of the two existing brands. 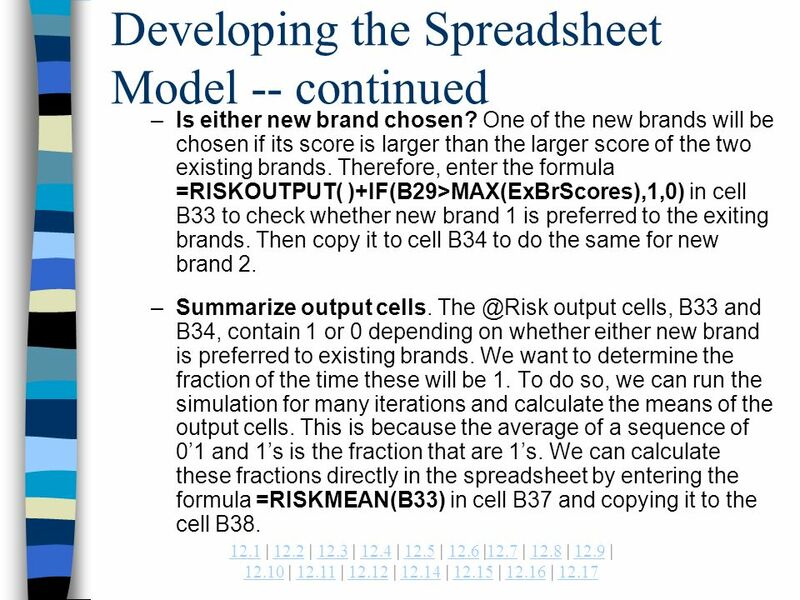 Therefore, enter the formula =RISKOUTPUT( )+IF(B29>MAX(ExBrScores),1,0) in cell B33 to check whether new brand 1 is preferred to the exiting brands. 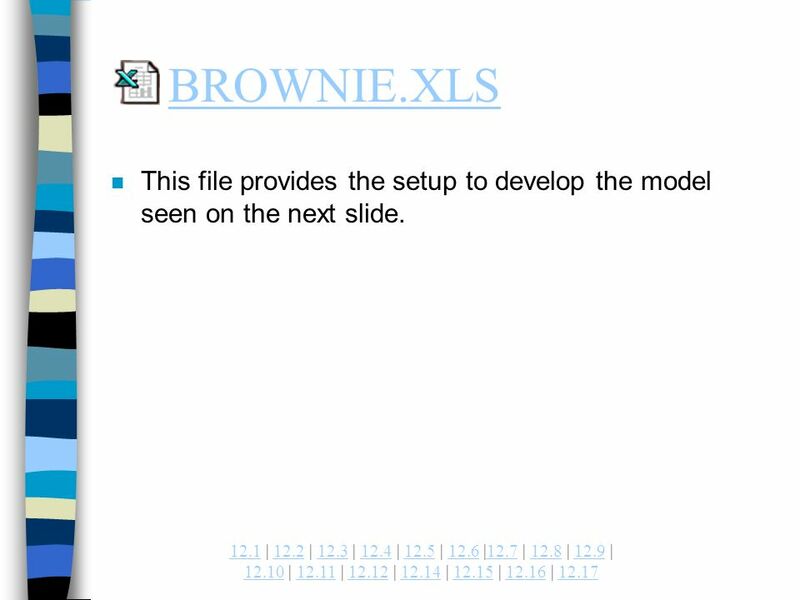 Then copy it to cell B34 to do the same for new brand 2. –Summarize output cells. 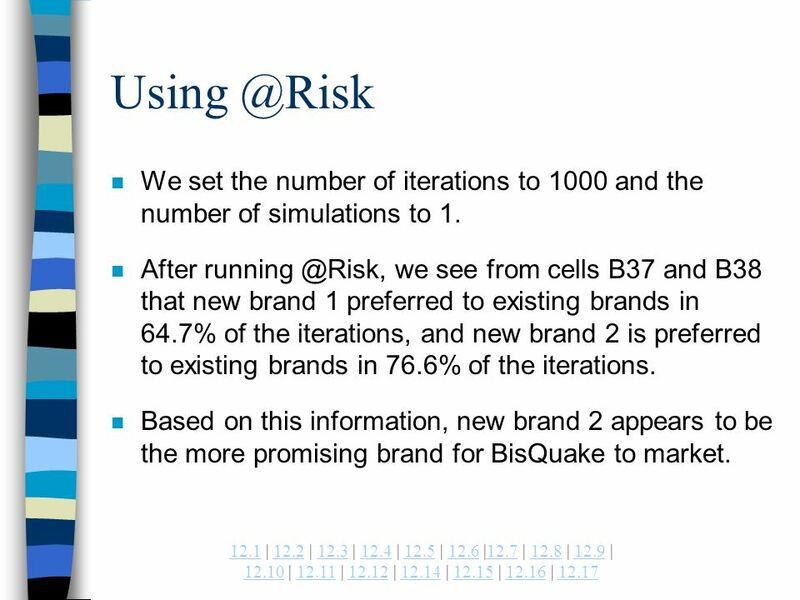 The @Risk output cells, B33 and B34, contain 1 or 0 depending on whether either new brand is preferred to existing brands. We want to determine the fraction of the time these will be 1. To do so, we can run the simulation for many iterations and calculate the means of the output cells. This is because the average of a sequence of 01 and 1s is the fraction that are 1s. We can calculate these fractions directly in the spreadsheet by entering the formula =RISKMEAN(B33) in cell B37 and copying it to the cell B38. 13 12.112.1 | 12.2 | 12.3 | 12.4 | 12.5 | 12.6 |12.7 | 12.8 | 12.9 | 12.10 | 12.11 | 12.12 | 12.14 | 12.15 | 12.16 | 12.1712.212.312.412.512.612.712.812.9 12.1012.1112.1212.1412.1512.1612.17 Using @Risk n We set the number of iterations to 1000 and the number of simulations to 1. n After running @Risk, we see from cells B37 and B38 that new brand 1 preferred to existing brands in 64.7% of the iterations, and new brand 2 is preferred to existing brands in 76.6% of the iterations. n Based on this information, new brand 2 appears to be the more promising brand for BisQuake to market. 14 12.112.1 | 12.2 | 12.3 | 12.4 | 12.5 | 12.6 |12.7 | 12.8 | 12.9 | 12.10 | 12.11 | 12.12 | 12.14 | 12.15 | 12.16 | 12.1712.212.312.412.512.612.712.812.9 12.1012.1112.1212.1412.1512.1612.17 @Risk Results n How do these results depend on the correlation structure we assumed earlier? 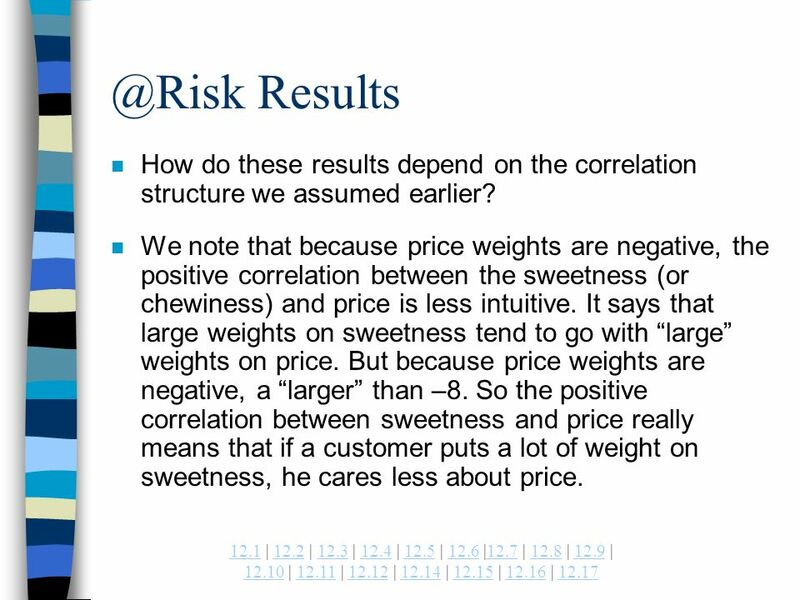 n We note that because price weights are negative, the positive correlation between the sweetness (or chewiness) and price is less intuitive. It says that large weights on sweetness tend to go with large weights on price. But because price weights are negative, a larger than –8. 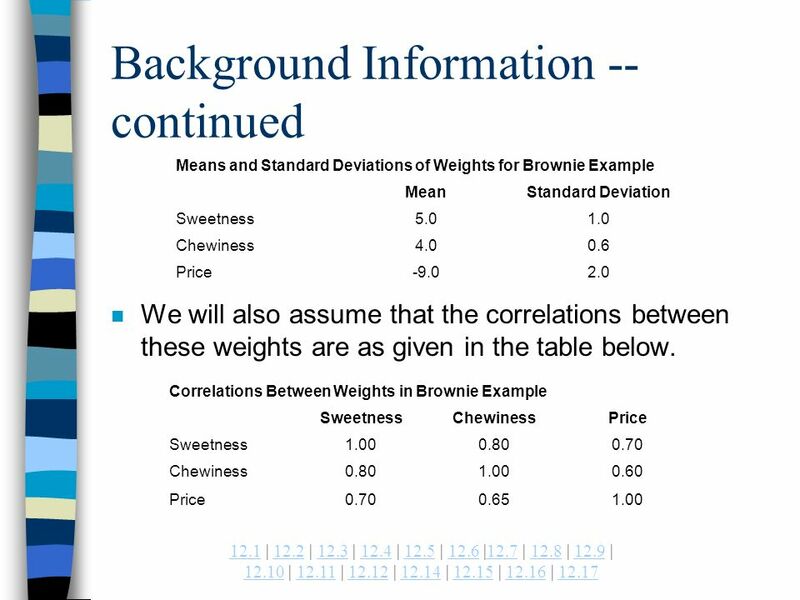 So the positive correlation between sweetness and price really means that if a customer puts a lot of weight on sweetness, he cares less about price. 15 12.112.1 | 12.2 | 12.3 | 12.4 | 12.5 | 12.6 |12.7 | 12.8 | 12.9 | 12.10 | 12.11 | 12.12 | 12.14 | 12.15 | 12.16 | 12.1712.212.312.412.512.612.712.812.9 12.1012.1112.1212.1412.1512.1612.17 @Risk Results n For the sake of argument, suppose you think that the weights a customer assigns to the three attributes are probabilistically independent. n Then we should change the correlations in all cells of the correlations matrix to 0 and rerun the simulation. 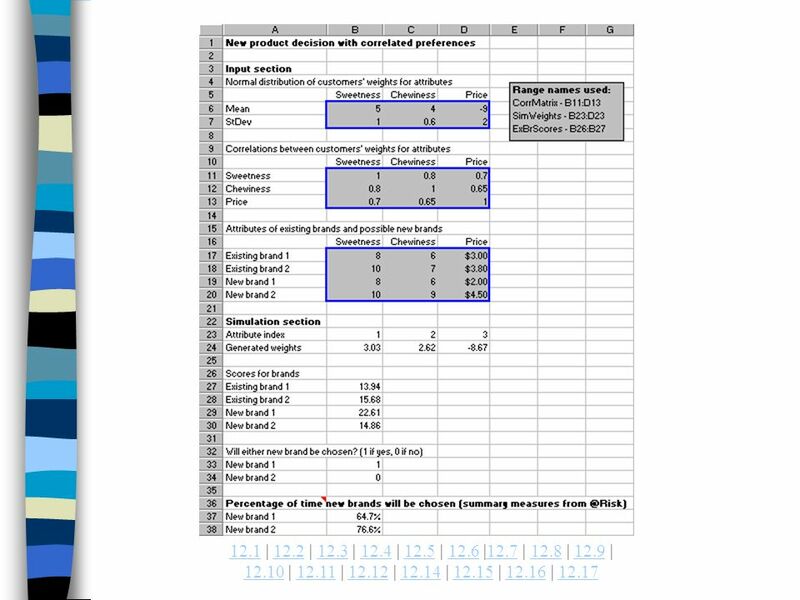 n When we did this, the values in cells B37 and B28 changed to 69.8% and 82.2%. n This is not a dramatic change, but it does show that correlations can make a difference. Download ppt "Example 12.13 Consumer Preference Models with Correlated Values." Example 7.3 Pricing Models. 7.17.1 | 7.2 | 7.4 | 7.5 | 7.6 | 7.7 | 7.8 | 7.9 | 7.10 | 7.117.27.47.57.67.77.87.97.107.11 Background Information n Suits.